It’s a warm Irish welcome as your tour group arrives at Dublin Airport or the ferry terminal. Depending on the size of the group, we may set off on a sightseeing tour of Dublin before checking into the local hotel. Your group will begin the day with a hearty ‘Full Irish’ breakfast in the hotel. We’ll then set off along the M1 via Drogheda and the Boyne Valley through Dundalk – to arrive in beautiful County Down, Northern Ireland. En route we will make a stop at the fascinating Heritage Museum which houses a real life production from the First World War – giving a dramatic glimpse at what life was like during those dark days. 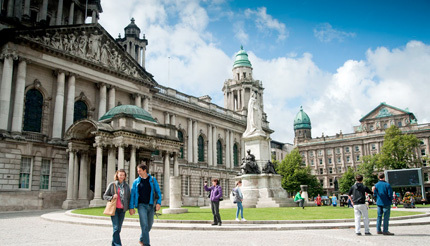 Once in Belfast, the tour group will enjoy a sightseeing tour of the old city – before continuing to the hotel for dinner and an overnight stay. After breakfast, your group will travel to Bushmills where they will enjoy a visit to, and guided tour of, the world’s oldest distillery, which was granted its licence in 1608. There will also be an opportunity to taste a variety of whiskeys made at the distillery. 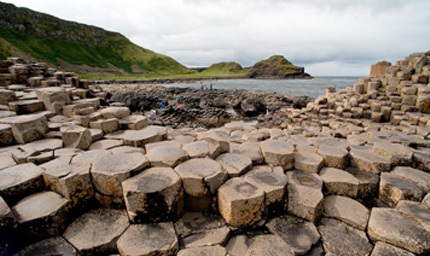 From there, it’s on to Giant’s Causeway – Ireland’s incredible sixty million year old natural wonder with amazing pillars and dramatic formations created by volcanic rock. It’s truly a once-in-a-lifetime experience. In the afternoon, the group will travel through Derry to arrive in Donegal for dinner and an overnight stay. After breakfast, the group has the option to take a tour of 15th Century Donegal Castle, or visit the home of the famous Donegal Tweed at Magee’s in the Diamond. In different ways, both are enlightening and fascinating excursions. Travelling onwards via Killybegs we will pass Slieve League: rising some 1,972 ft above the ocean these sea cliffs are the highest in Europe and are not to be missed. At Glencolmbkille, the group will visit the Folk Museum – a beautifully-curated exhibition that depicts rural lifestyles through the ages. Going on to Ardara, the weaving capital of Donegal, the group will have time to spend in the many shops selling locally-made tweeds and hand-knits. Then, travelling along the beautiful Donegal Coast with its majestic coastal views, we’ll arrive in Dungloe, where the popular ‘Mary from Dungloe Festival’ takes place every year in July. We will then prepare to return to the hotel for dinner and an overnight stay. After breakfast we’ll travel to the border town of Belleek and visit the renowned Belleek Pottery. Founded in 1857 this is one of the world’s oldest working potteries. The group will enjoy a walk through the museum, as well as a 20 minute video presentation on the history of the company. Then it’s back on the road, travelling alongside the beautiful lakes of Fermanagh, after which we will arrive in the busy town of Enniskillen for a visit to Enniskillen Castle and Museum. In the afternoon, we will embark on a visit to the Ulster American Folk Park, a fascinating outdoor museum which tells the story of emigration from Ulster to North America. After this, the group will return to the hotel for dinner and an overnight stay. We’ll bid farewell to Donegal after breakfast and will begin the journey to Ireland’s exciting capital city, Dublin. We’ll travel through Yeats Country, have lunch in the Mullingar area and arrive in Dublin where the group can choose from various sightseeing options. We’ll then check into the hotel for dinner and an overnight stay. After breakfast in the hotel, the group will taken to the airport or ferry terminal – and begin the journey home.